KC Foodie Park proposal held over for a month – Welcome to Wyandotte Daily! The KC Foodie Park application for a change of zone at the Indian Springs site was held over until the Jan. 14 City Planning Commission meeting to resolve issues. The application went before the City Planning Commission on Monday night. The site is a former mall near 47th and State Avenue. Among the reasons the application was held over was that the UG is waiting for the master plan to be updated, plus there were some issues to be worked out on where trucks could park, a sidewalk, the color of the building, drains, the possibility of rotating the building, and irrigation for plants in the landscaping. Curtis Peterson of Polsinelli represented the KC Foodie Park application by Scavuzzo’s, a food service company. A neighborhood meeting on the proposal was held in November. Peterson said they took into consideration what residents said they wanted for the site in a survey done last year. According to agenda information, it will be a 234,716-square-foot distribution and food service center, also with office and retail buildings. Three restaurants along State Avenue are shown on the plans. Peterson said the north side and south side buildings would be constructed in the first phase of the project. The north side buildings are restaurants along State Avenue. A 26-acre solar park also are part of the plans. The planning commission asked some questions about the proposal, which is still at a conceptual level. There were concerns about traffic, especially truck traffic at the site. Peterson said there is a dual process in talking with the UG administrator’s office on issues such as owning or leasing the property. He said Scavuzzo’s hopes to own the property for its own food service distribution building and offices, while individual restaurant sites might be owned by the restaurants that move in there. Peterson explained the applicant’s reasoning behind each of the issues that were before the planning commission. For example, the color of the building fits in with the energy conservation design that is planned. Also, the landscaping designed for the project uses plants that require little water, and is part of the project’s LEED goal. He did not present information about the cost of the project or the method of financing at this meeting, as financial issues were not part of the zoning meeting. 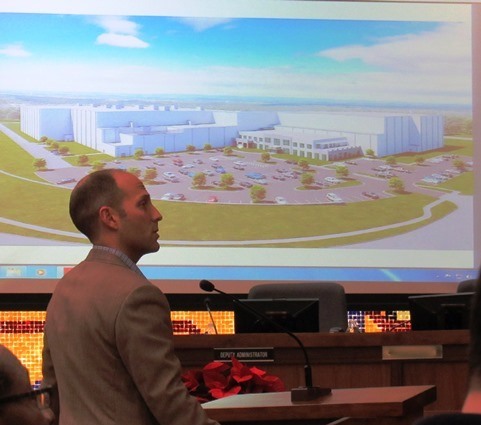 No one appeared in opposition to the KC Foodie Park project at the Dec. 10 meeting. Rob Richardson, UG planning director, said he was very excited about the project and thinks it will be a great asset to the community. In other action, the planning commission voted 5-2 to approve the Brune Elementary School application including staff stipulations of a sidewalk. The district is building a sidewalk in one area of the project, but is not building a sidewalk in another area that the planning staff is requesting. A representative of the Kansas City, Kansas, Public Schools appeared and told the planning commission that the district did not own the land on which it is being directed to build a sidewalk, and the owner of the land did not want to sell a portion of it for the sidewalk. Planning staff suggested that the district should condemn the land, but the school district representative said the district had not done any eminent domain projects in the past seven years. The school district’s representative said the district has decided to bus all students to the Brune school, and there would be no students walking to it. However, a member of the planning commission said she was concerned about the safety of students without the sidewalk. The new school at 8833 Waverly Ave. is being built in a neighborhood that does not have sidewalks already. Many of the neighborhoods in the western part of the city were built before annexation, and the county did not require sidewalks at that time. The Brune school application had previously gone to the UG Commission, which sent it back so that a solution could be worked out at the City Planning Commission level. For a previous story on the KC Foodie Park, visit http://wyandottedaily.com/kc-foodie-park-at-indian-springs-on-tonights-city-planning-meeting-agenda/. 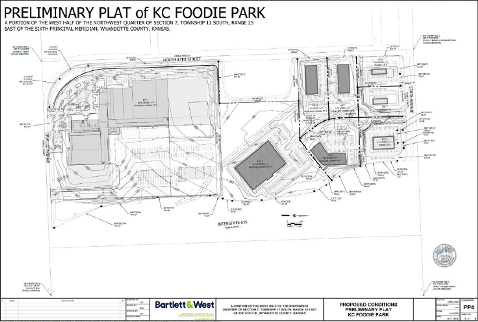 A plat of the KC Foodie Park project at 47th and State Avenue. To the right of this plat are proposed restaurant sites along State Avenue.